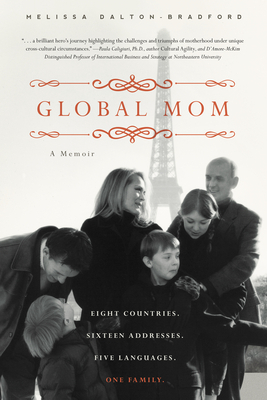 After more than twenty years living internationally--sixteen addresses, eight countries, and five different languages--writer Melissa Bradford shares a fantastic journey of motherhood that will inspire any family. Follow this family of six on their passage--extraordinary, hilarious and heartbreakingly poignant--from Bright Lights (of New York City) to the Northern Lights (of Norway) to the City of Light (Paris) to the speed-of-light of the Autobahn (in Munich). Continue deep into the tropics of Southeast Asia (Singapore) and end your voyage in the heights of the Swiss Alps (Geneva). As varied as the topography--the craggy fjords, the meandering Seine, the black forests, the muggy tropics, the soaring Alps--this multicultural tale traverses everything from giving birth in a ch teau in Versailles to living on an island in a fjord. From singing jazz on national Norwegian T.V. to judging an Indonesian beauty contest. From navigating the labyrinth of French bureaucracy and the traffic patterns of Singapore to sitting around a big pine table where the whole family learns languages, cultures, cuisines--where they, in short, learn to love this complex and diverse world and, most importantly, each other. Melissa Dalton-Bradford is a writer, independent scholar, world citizen, and mother. She holds a BA in German and an MA in Comparative Literature, both from Brigham Young University. She speaks, reads and writes fluent German, French, and Norwegian, is conversant in Mandarin, and has taught language, humanities, and writing on the university level. Bradford has performed professionally as a soprano soloist and actress in the US, Scandinavia, Central Europe, and South East Asia. She and her husband raised their family of four children in Hong Kong, Vienna, Oslo, Paris, Munich, Singapore, and Geneva, Switzerland.